Formfutura FlexiFil White 1.75mm is a flexible filament (Shore: 45D) and 100% opaque. Items printed in 3D with this White elastic filament will have a perfectly clear and fresh appearance. Comes in a 500g spool. 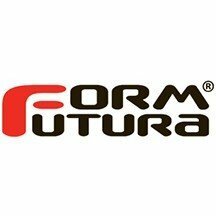 Formfutura FlexiFil Natural 1.75mm is a flexible filament (Shore: 45D) and 100% opaque. Items printed in 3D with this Natural elastic filament will have a perfectly clear and creamy appearance. Comes in a 500g spool. Formfutura FlexiFil Black 1.75mm is a flexible filament (Shore: 45D) and 100% opaque. Items printed in 3D with this Black elastic filament will have a perfectly Dark and opaque appearance. Comes in a 500g spool. HDglass Blue from FormFutura is a PET filament that can be safely used with food, as well as being 90% translucent. HDglass filament lets light pass through with very little interference (1%). 750g spool. Formfutura Coconut is a filament composed of 40% coconut wood fibre mixed with PLA. Objects printed in 3D with this filament will have a 'woody' odour and feel. Comes in a 500g spool. Formfutura Olive Wood 1.75mm is a filament made up of 40% green wood fibre mixed with PLA. Objects printed in 3D with this filament will have a 'wooden' odour and feel. Comes in a 500g spool. Formfutura Ebony wood 1.75mm is a filament made of 40% dark wood fibre mixed with PLA. Objects printed in 3D with this filament will have a 'wooden' odour and feel. Comes in a 500g spool. ApolloX filament from FormFutura is a professional high-performance filament composed of ASA derivative. It has good thermal stability that lets you print easily, without warping and with flawless inter-layer bonding. Comes in a 750g spool. EasyCork 1.75mm light filament from FormFutura is made of PLA and 20 to 30% cork fibre. This material has the same properties as cork – it is light and impact resistant. Comes in a 500g spool. EasyCork dark 1.75mm from FormFutura is a filament based on PLA and 20 to 30% cork fibre. With features similar to cork, this filament for 3D printing is light and resistant to impacts. Comes in a 500g spool.